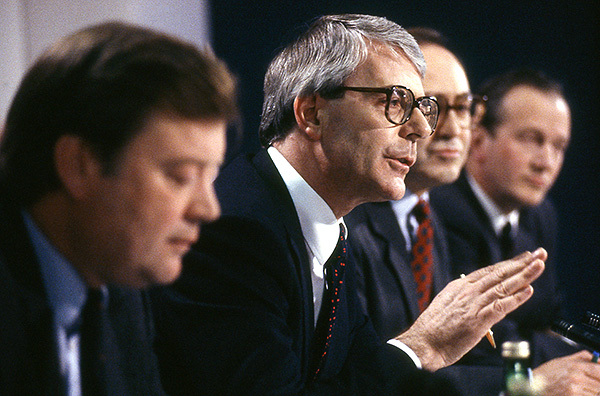 Whilst memory lane is the venue I thought that I’d add this photograph of the former British Prime Minister, John Major along with his cabinet colleagues Kenneth Clarke and Michael Howard taken on the 20th of May 1991. This isn’t a particularly interesting picture except that it is from the set that became the very first ever colour front page on the Times Educational Supplement. This was almost three years before I actually joined the paper on the staff but it has always been a matter of pride that I was the one who shot the picture that changed the paper for ever. This picture was at the press conference where John Major and his Government launched their new policy for post sixteen education. It wasn’t that long after Mr Major had taken over from Margaret Thatcher as Prime Minister and press photographers were still trying to get the hang of the new man and his rather relaxed style. It’s amazing to think that the man in the foreground (Ken Clarke) is once again a member of the government all of these years later and still clearly loving the cut and thrust of political life. When we first started to shoot colour for the paper we just adapted the way that we already shot pictures for a variety of news magazines – on colour transparency stock. It was always funny to be rubbing shoulders with other photographers, almost all of whom were shooting fast black and white film, and having to get good pictures in often poor light with either 100 ISO Fuji RDP transparency film or Kodak’s rather good 160 ISO tungsten balanced slide film. This one was shot on the Kodak tungsten film pushed one f-stop to 320 ISO – which was about as high as you could go without getting washed up pictures. Back in the day the transparency would have been scanned by an expert on a very expensive drum scanner and the separate plates for the pages would have been made by other technicians. How things have changed. London had a couple of very good 24 hour labs in those days and shooting transparency was, in a lot of ways, pretty relaxing once you had got the exposure correct. All you had to do was drop off the film, go and have a cup of coffee and pick up your processed images about an hour and a half later. The TES offices were very close to my favourite lab – Metro – and so you could either let the paper collect your film or go along yourself and do an edit before they saw them. I have been filing some old pictures and found this one completely by chance twenty years down the line. I guess that my journey down memory lane is still going on!